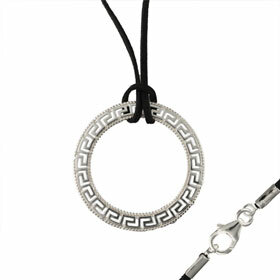 This dynamic sterling silver pendant features the classic Greek Key Motif in a circular design. It is wrapped in an eternal circle as the Greek Key symbolizes eternity. This one of a kind necklace makes a perfect gift to show someone your eternal love. It comes with an 18" cord. Sterling Silver Earrings - Greek Key Circular (28mm) also available.